How much will my home loan repayments be if I take a split home loan? If there is the question you have asked yourself, you can use this FREE split home loan repayment calculator to work out what the weekly, fortnightly or monthly loan repayments would be for any loan amount. This split home loan mortgage repayments calculator tells you monthly, fortnightly, or weekly home loan repayments of a Principal and Interest home loan or an Interest only home loan. I find the fortnightly mortgage payment or bi weekly mortgage payment is really useful because I am paid biweekly. The split mortgage home loan repayment calculator allows you to compare up to five home loans. You can also see how extra repayments can affect your home loan mortgage repayment in terms of time and amount. 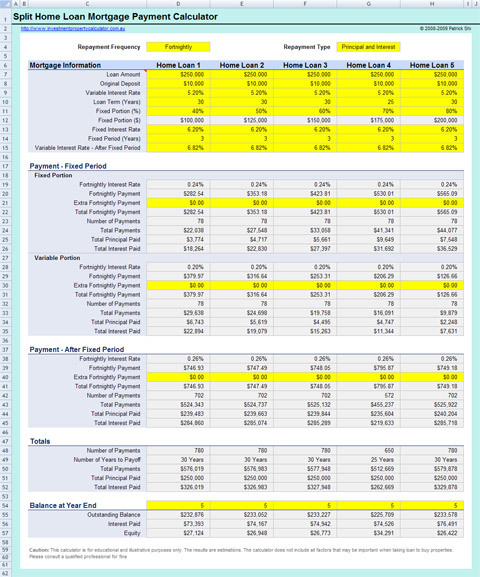 Download FREE Mortgage Split Home Loan Repayments Calculator Now! For your information, split home loans cut your loan into portions. Usually the split is a Fixed Portion and a Variable portion. You can also split your home loan into two variable rate loans, or even two fixed rate loans. The split can be set up at any percent. Split rate loans are popular in times of uncertainty about home loan interest rates, especially if the rates are likely to move up. For example, spliting part of your home loan out at a fixed interest rate means no matter how the home loan rates increase your repayments for the fixed portion will remain constant until the fixed period finishes. While if the interest rates fall, your repayments for the variable portion will also fall. This means you kind of balance the impact of home loan rate changes - if rates go up you are partially insulated and if rates go down you are also partially protected. If you'd like the security of a fixed rate home loan, and the benefits of a variable loan, you'll get a split home loan. However, make sure you do your own research and compare all your options first. 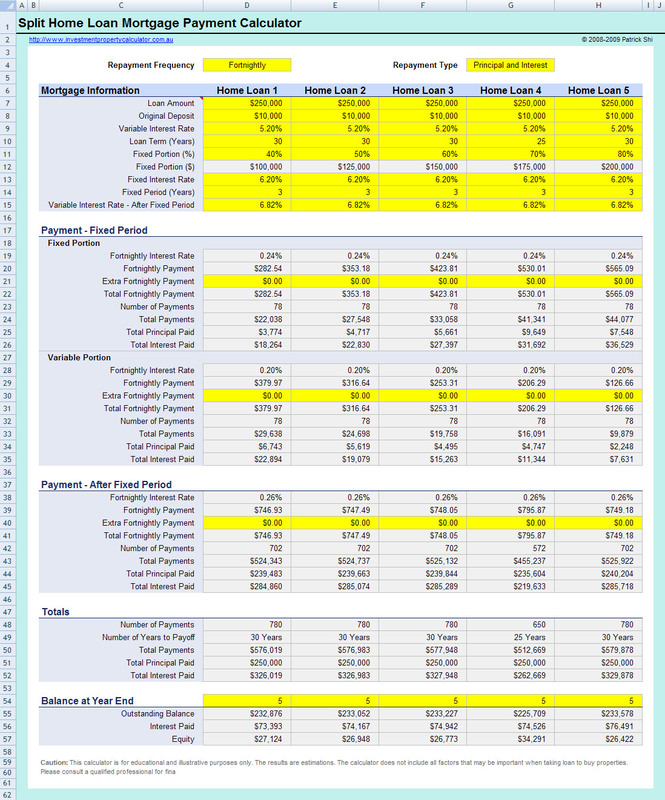 BTW, If you plan to refinance your home loan, there is a Free Mortgage Home Loan Refinance Calculator that you can download to do mortgage refinancing analysis.